I am not going to attempt to define what mastery is or even peek inside the can of worms concerning assessment and mastery. Instead, what I want to discuss is how these elements manifested themselves in the 2017 KS2 SATs papers. I frequently hear from Year 6 teachers that they don’t have time to teach following the ‘mastery approach’ (whatever this may be). They don’t have a year to get children prepared for SATs and regardless of which side of the formal testing fence you sit on: they are a reality. Good results are vital for many of the schools I have the privilege of working in. However, having spent an unhealthy amount of time unpicking the KS1 and KS2 2017 Maths SATs papers, I want to highlight that there are a number of strands of the mastery approach which the test developers are exploiting – a blunt but effective way of drawing our attention to them. 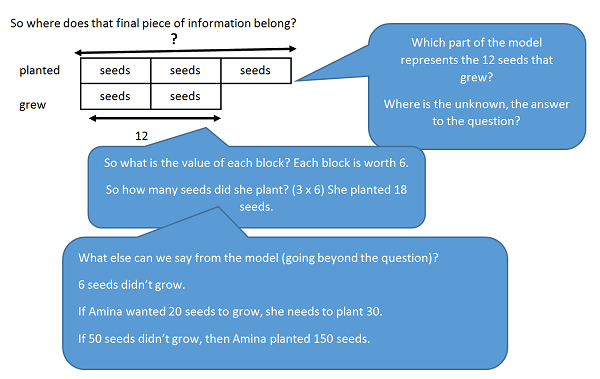 Performing well in SATs and developing learning so that it creates a deep, rich and interconnected view of the mathematics landscape are not mutually exclusive things: you can have both. Variation in presentation; the same core idea being presented in a range of different ways. There are many examples of variation in presentation in the KS2 SATs papers. At the most fundamental level are the purposes of the different papers: Paper 1 is purely arithmetical (do they have the skills to calculate? ); Papers 2 and 3 are the so called ‘reasoning papers’ (can they apply their maths skills?). But if we look a little deeper, the variation becomes more complex, probing the children’s understanding of the core concepts. …yet deeply confusing for those who are just trying to click through steps – how can the answer be the same? Many might be inclined to think the answer is zero or one. 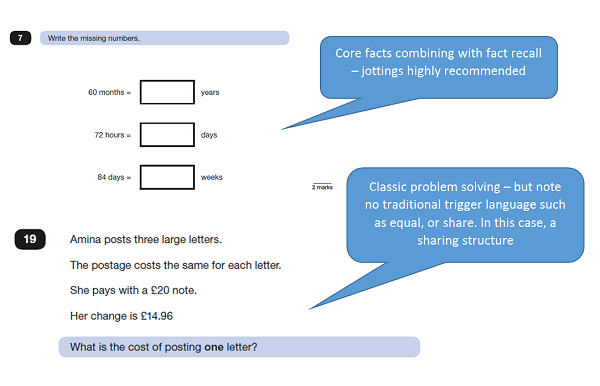 The question above uses traditional division language (‘share’, ‘equally’), but, despite using ‘share’, it is a grouping structure – how many groups of 16 can I take from £80? 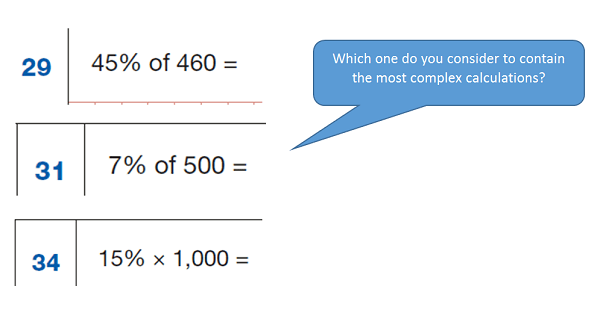 I believe that Q34 is the most straightforward – it involves applying an of understanding ‘x’ and ‘place value’ (15% x 100 = 15, so 15% x 1000 = 150). So why has this been placed further into the paper? 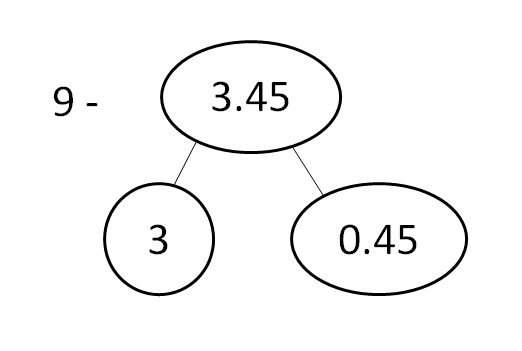 It is considered more challenging because it uses the less frequently employed abstract symbolic, but the actual computation is much simpler. How many children have not explored multiplication in its different disguises? This question checks that children have a secure understanding of place value and the inclusion of the tricky number zero. Paper 1 presents division calculations in both linear and division bracket forms. Children need to be aware that just because the division bracket has been used, does not mean they have to do a formal division calculation. This brings me nicely to the next key element: multi-strategy discussions. 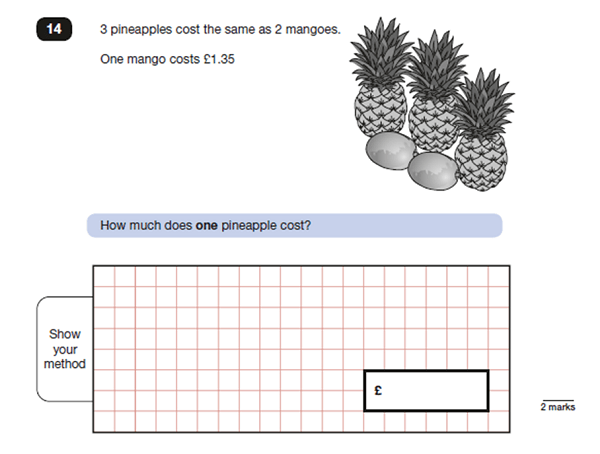 By Year 6, many children appear to throw their lot in with formal calculation methods. They click unthinkingly through the mechanical steps, not estimating or checking for appropriateness – just accepting that the magic formula knows best. Children should be engaged in multi-strategy discussions, not just identifying one way of solving a calculation but multiple ways as only when we have a choice can we be efficient. Now, please don’t get me wrong, I am not anti-formal methods; I just believe they have their place alongside a range of methods. There is no hierarchy. Regrouping the subtrahend: the amount being removed in a subtraction calculation. Take 3.45 from 4 (using our compliments to the whole), leaving 0.55. 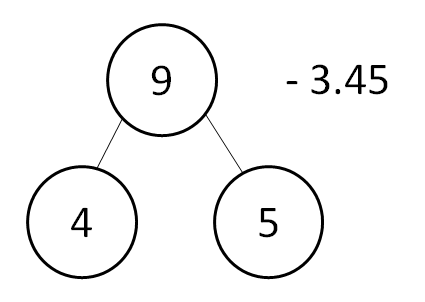 Equal difference: add 0.55 to both the minuend and subtrahend – changing the calculation to a simpler but equivalent one. I am sure that you have other ways of solving this calculation. And that’s the point – we all have different ways. If we don’t encourage children to playfully explore this world of numbers, we deny them the excitement that comes from being in control and manipulating numbers with understanding. The third element takes aspects of both of the above. Altogether, 12 seeds grew. How many seeds did Amina plant? All of this information can translate into a bar model very easily. The equality between the two statements now takes on a physical form, making spotting the operations required more obvious. We can engage our children in good mathematical debates over which strategy is preferable and why. We can mix up the language and presentation to ensure that the understanding is deep and linked. We can create models which not only help children understand what operations are required, but take their ability to reason to the next level and explore complex concepts from different directions. This will not only prepare the children to perform well in SATs, but encourage them to explore the maths landscape more widely for themselves. In this way, they will create their own maps and forge new pathways, rather than relying on Teacher SAT Nav. Charlie Harber is Deputy Lead Adviser for Primary Mathematics at Herts for Learning. Herts for Learning Ltd is the UK’s largest Schools’ Company, with 521 shareholder schools. We provide an ethical and informed approach to school support, within Hertfordshire and, due to an increasing recognition of our work, increasingly beyond our borders.